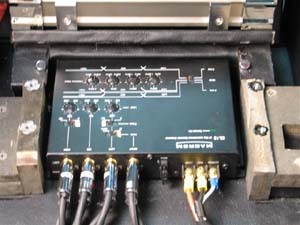 This is our 5 channel Amplifier, the 5G900 Xetec from Germany. It has 4 analog channels at 100W each @ 4 ohm and a mono digital 360W @ 4 ohm. 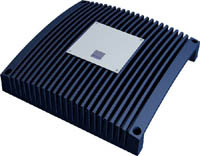 We later ran it at 2 ohm, giving us 560W,powering that single 10" sub. This amp has THD less than 0.0002, SNR less than 92dB, variable highpass & lowpass filters, separate bandpass filter, variable lowpass and subsonic filter for the sub, phase adjust and parametric EQ. 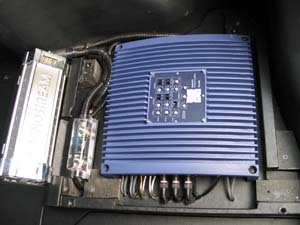 Input sensitivity 200mV-6V and includes a remote bass controller. We also chose it for the small footprint since we had very limited space and did not want the trunk to lose much space. 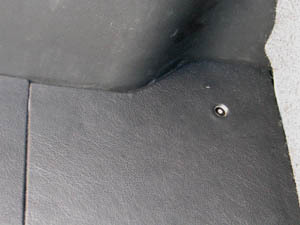 We replaced the trunk lining with a new floor made of MDF and covered with black PVC to match the plastic side panels. 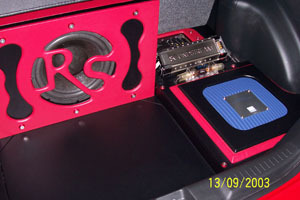 The new floor was then bolted onto the chassis for extra rigidity, as an anchor for the sub box later. 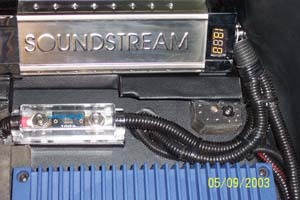 We also used a 1 Farad capacitor from Soundstream that has Voltage indicator in amber coloured LED to match the dash lights. Another 100A fuse was also added in between the cap and the amp for extra precaution. Here you can also see the Macrom 3-way Electronic Crossover we used during the competition. 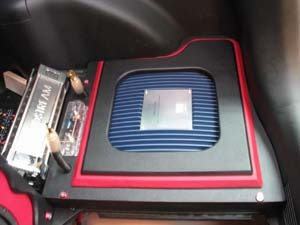 In the preliminary round it was mounted under the driver's seat, but we moved it into the trunk for the final round for extra points. 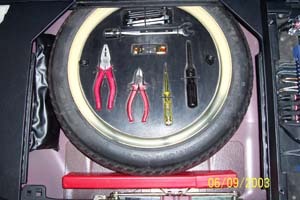 Last and not least we made an emergency tool kit under the floor inside the spare tyre. A fire extinguisher and a first aid kit were also installed into the trunk.